For all people of Corato, that day has remained memorable. Three days later there was her solemn funeral with the participation not only of the people of Corato but also of so many people from neighboring countries and all those who knew her. In Corato, Luisa was called by all "Luisa the Saint." Seventy years after her death the public association of faithful Luisa Piccarreta in Corato organized two days of prayer, study and fraternity. We intend to do the route point that the knowledge about Luisa and the doctrine that flows from her writings has done during these years. The Archbishop wanted to give a diocesan level to this two days by marking the opening and closing of them with the Eucharistic Celebration presided over by him on Saturday, March 4 at the Shrine of the Oasis of Nazareth, and the next day in the Cathedral of Trani. March 4 has always been remembered as a special day even after Luisa's death. On 4 March 1948 the Archbishop of time, Reginaldo Maria Addazi, attributed to Luisa Piccarreta the title of Servant of God and published a holy card that bore, with his imprimatur, the prayer to implore her beatification. Again on March 4, this time in 1987, Archbishop Giuseppe Carata erected the Pious Association Luisa Piccarreta Little Children of the Divine Will in Corato. For some time there was in Corato a group of people around to Sister Assunta Marigliano that wished to welcome Luisa’s inheritance. So the Pious Association had precisely the task of not only keeping alive her memory, but also of spreading her spirituality. In 2010 our Archbishop Giovan Battista Pichierri wanted to raise the Association to a Public Association of the Faithful, thereby recognizing that its general aims are a benefit for the entire diocesan Church. And more clearly that the knowledge and dissemination of the spirituality of the Servant of God Luisa Piccarreta are a benefit for the whole Archdiocese. For this reason, 4th March 2017 will also mark the 30th anniversary of the establishment of the Association. In the last 70 years the knowledge of the gift of living in the Divine Will has come a long way all over the world. We saw proof of this also with the large number of visitors of the website www.luisapiccarretaofficial.org. It receives daily contacts from many countries and is translated into three languages. On the website you can find all the information and the possibility of following the two days event via live streaming. Another purpose of the meeting is to better define the charisma of Luisa Piccarreta, that is, the specific message that she communicated to the Church through her life and her writings. This will be a task entrusted to Sister Assunta Marigliano, founder of the Association of Corato, and Don Carlos Massieu, one of the first priests who spread in the world the knowledge of the Servant of God. These days you will find the prayer in the typical forms with which Luisa used to pray: "The Hours of the Passion," "The Rounds", meditations on some passages of her "Diary" on which, we are working for the critical edition. 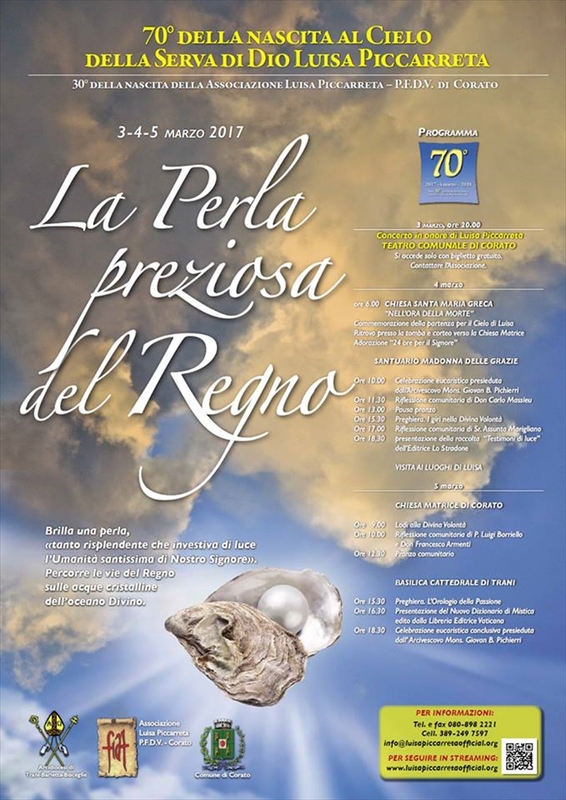 In preparation for the two days event, on the evening of March 3 at the Municipal Theatre of Corato there will be an event entitled "Pure Spirit. Meditation between music and words on the life and works of Luisa Piccarreta" to which you will be allowed to access with a pass that must be picked up at the Association. We hope that through these two days event many inhabitants of Corato and diocesan faithful can approach and learn more about this wonderful mystic of our times. If it is true that we are living through difficult times, it is equally true that God does not leave His Church without special gifts in order to experience them with a view to the advent of His Kingdom.